"Sampath Speaking" - the thoughts of an Insurer from Thiruvallikkeni: extended MRTS to Ponneri / Sulurpet; Thiruvallur, Arakonam and more !! 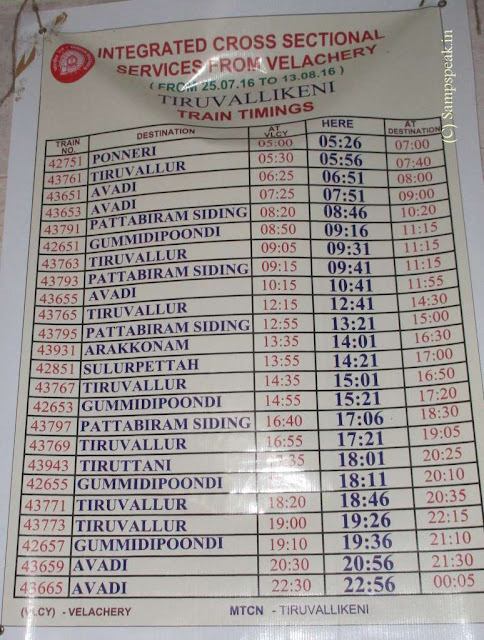 extended MRTS to Ponneri / Sulurpet; Thiruvallur, Arakonam and more !! Triplicane boasts of many historic places laced with spiritualism. In 1600s, Triplicane was a separate village. Besides Marina, one added attraction is Thiruvallikkeni MRTS Railway station. Parakkum rail (not the full path though ! )~ is Chennai Mass Rapid Transit System, a state-owned subsidiary of Indian Railways, unique elevated railway line in India. The line runs a distance of 19.34 km (12.02 mi) with 18 stations, from Beach to Velachery…… with plans to get extended to St Thomas Mount thereby getting linked to the existing Beach Tambaram EMU line. The alignment from Chennai Beach to Park Town is along the existing broad-gauge suburban system; alignment from Park Town to Thirumayilai is along the Buckingham canal (6.21 km (3.86 mi), elevated) ~ further till Velacherry is also on elevated line. Parakkum rail is not exactly overcrowded. It has the following Stations – last year, Commuters had something to cheer as six car rakes were replaced with nine cars. It has come a long way since that operational run between Chepauk to Beach station in Nov 1995; even when it got extended till Thirumaylai in Oct 1997, many a times, the trains ran near empty. Now they are getting filled up at Velachery station itself in the peak hours, though the maximum of commuters board at Thiruvanmiyur. Some commuters feel that the running time has slowed down considerably and that trains are now running much slower. The not-so-great patronage has many reasons, primary being that many are not on residential locality and remain not easily accessible. From its formative years, we have felt and represented to authorities that the way leading to the station should remain well-lit and clean. The completion of 5 km stretch from Velachery to St Tnomas Mount is much awaited and expected to change the fortunes of Railways. However it is stated that a small stretch that links the MRTS to the St. Thomas Mount station has not been completed due to delay in acquisition of land for a distance of just 500 metres ! The line currently transports less than 25 percent of its projected passenger capacity- and it is projected that if lines are extended, enabling passengers to travel longer distances without changing the train, the patronage would go up. Now a trial scheme introducing new trains connecting surban stations to those on the Mass Rapid Transit System (MRTS) line in Chennai is set to make intra-city transport faster and easier. Suburban train commuters travelling from Tiruttani, Tiruvallur, Avadi and Gummidipoondi to stations on the MRTS stretch need not get down at Chennai Beach and change trains to reach Mylapore or Velachery. Neither will commuters need to get down at Chennai Central and cross the Poonamalee High Road to rush to Park Town station to take the MRTS train. Southern Railways recently announced 51 integrated cross-sectoral services between the south-western and north-eastern suburbs and Velachery. 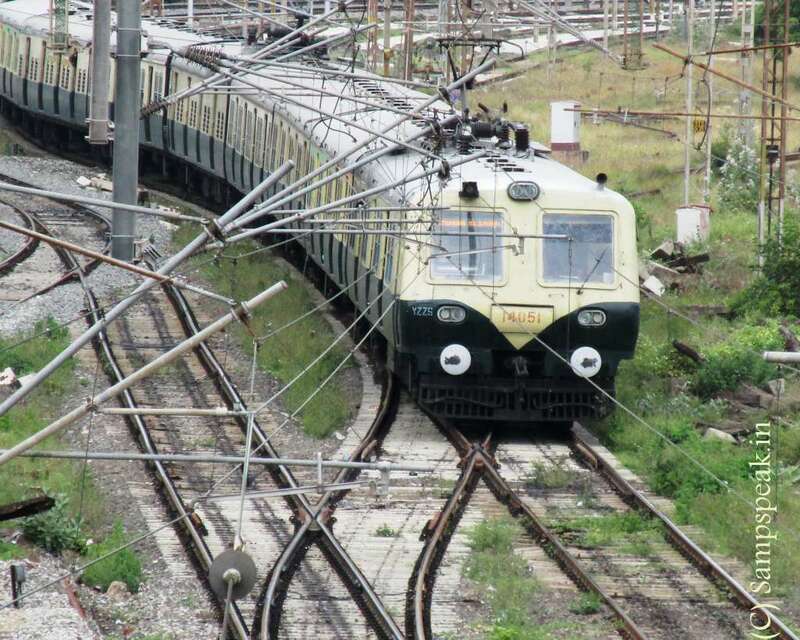 While 27 trains will operate from suburbs to Velachery, 24 will run in the opposite direction. At present, only six such cross-sectoral services operate despite a daily passenger footfall of 15,000 in each direction. This move will ease suburban train commuting and also cut down travel time by at least 30 to 45 minutes per journey. Commuters can take the same train, without worrying about missing the connecting train at Beach station, or having to navigate through heavy road traffic in front of the Chennai Central station to reach Park Town. 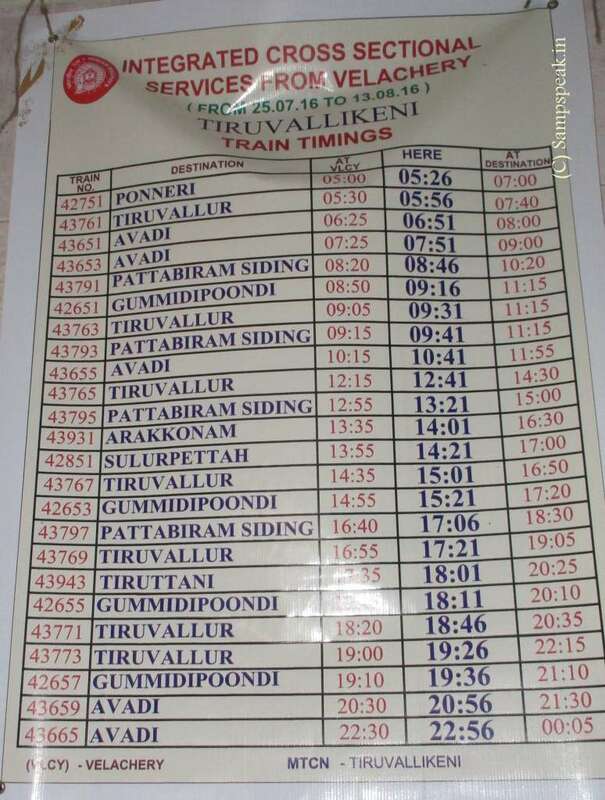 This is a boon for Triplicanites travelling by MRTS – they can take direct trains to Arakonam, Thiruvallur, Avadi, Gummidipoondi, Ponneri, Sulurpet !!! The big catch is – it is on experimental basis from 25th July till 13th Aug 2016 – depending on the patronage and passenger increase, the Railway authorities would take further decisions, it is stated. 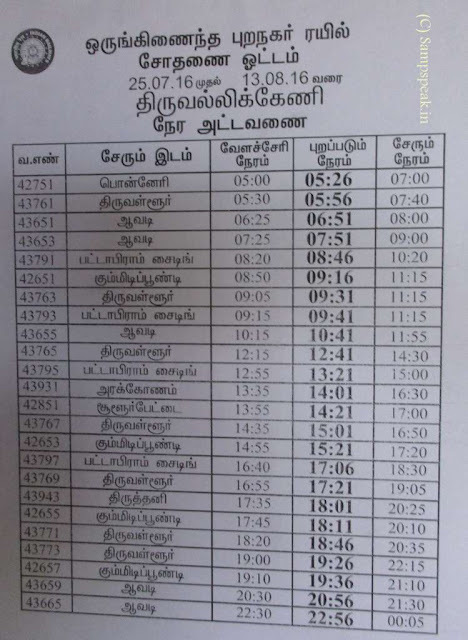 For the benefit of users, here are the train timing schedule from Triplicane … So, the facility is available – it is for us to use, send strong message and ensure that this extended service becomes permanent ! Duleep Trophy turns pink !! threat of another tsunami in 2009 !! !